Interesting. That’s the word stuck in my mind after taking in Blade Runner 2049. Not good. Not bad. Interesting. 2049 is not Ridley Scott’s Blade Runner, and quickly shirks off any notion that it could be. It takes its own tone immediately, albeit a subservient one. Scott’s film is the Big Bang, 2049 simply another chapter. Some portions of the nearly 3-hour sequel are unique in its own right, many are little more than watered-down echoes of the original, and yet more aspects unfortunately play out like any standard modern Hollywood action movie. 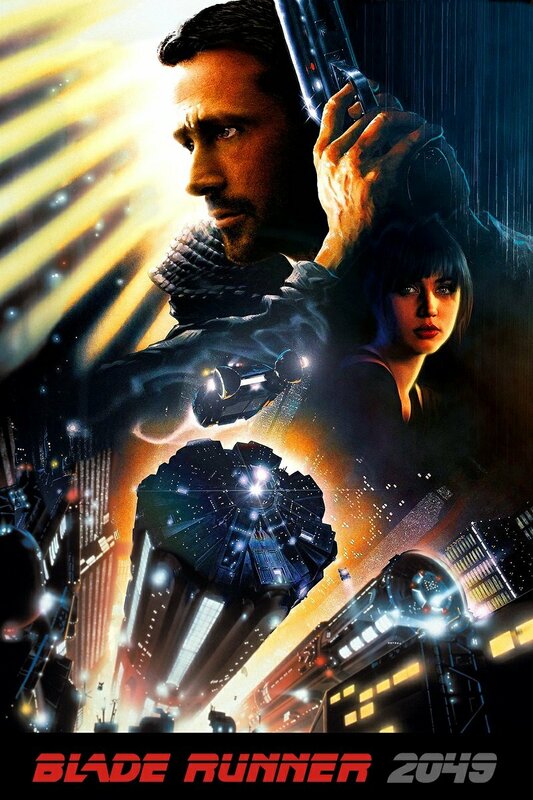 The strongest comparison between the original Blade Runner and this sequel is that both are mixed bags, difficult to define and challenging to process, somehow inspiring and disappointing all at once. There are parts of 2049 that I really liked. The director, cinematographer, and cast all make substantial contributions, but at its core the bulk of 2049’s success feels like it belongs to screenwriter Hampton Fancher. In its best moments the movie is dominated by his engaging story and highlights his penchant for cloistered, moody set pieces, with characters coming into intense and intimate contact in segments that feel almost like scenes from an off-broadway stageplay. Fancher took a similar approach with his first draft of the original Blade Runner movie, setting the action (or lack thereof) in just a few rooms, and there is a good bulk of 2049’s running time spent in this territory. It’s cool to see things go full circle, and for me these “one room” character-focused moments were the most compelling. The main flow of the story bears Fancher’s signature detective-style twists and turns, several with clear answers but more than a few without. Some viewers will find the character arcs in 2049 easier to follow and perhaps more satisfying than those in the original Blade Runner, but that’s not to say that the sequel entirely shies away from dishing up some of that ol’ Blade Runner ambiguity. That’s sort of the thinly-laced master thesis connecting the two Blade Runner movies- what’s “real” is ultimately open to interpretation, both by the characters onscreen and the audience itself. Here’s what I didn’t like: For all 2049’s efforts to be something special and original- the Fancher-infused noir showdowns, exquisite shots of weird landscapes draped in light by cinematographer Roger Deakins, and intense, thoughtful performances coached by director Denis Villeneuve, there is a whole lot of painfully conventional 2017 Hollywood fare that feels as mass produced and soulless as the film’s Replicants. Things go boom, people run, there are extended fist fights and well-orchestrated kickboxing dances, all seemingly plopped in as if required by movie-making law. It’s the “superherofication” of film in full effect, with many scenes fitting seamlessly into the latest Avengers entry as into this movie. The most chilling thing to me were the hints at a broader world (ie, more sequels) depicted in scenes that fly dangerously close to Matrix Reloaded territory. I’m not sure the world needs a Blade Runner cinematic universe (actually, I’m certain it doesn’t), and seeing iconic images and props from the first film thrown around like X-Wings or Tolkien orcs kind of made me cringe. The biggest missing element is without a doubt the distinctive touch of original director Ridley Scott. The layers and teeming energy of his 2019 L.A. is never close to being touched in the sequel, and in fact any effort to emulate it at all is very much absent from 2049. Villeneuve shows us the world from high above, rarely venturing down into it with the same gusto that Scott did. When we are on ground level, it’s mostly in spartan corporate lobbies and clean police offices. The chaotic crowds of the supposedly super-populated future are really nowhere to be found. The few glimpses of the trademark Blade Runner cyberpunk world feels like b-roll from the first film. There is one exception- when Villeneuve takes us to San Diego, now an extended garbage dump, in what is his movie’s most original sequence. I wish we had seen more of that- less flying cars, more feet on the ground. Again, at nearly 3 hours there’s a whole lot to take in from Blade Runner 2049. I liked a lot of its ambitions, disliked a lot of its seemingly corporate-mandated tropes, but overall kind of loved the experience as a whole. 2049 takes a lot of swings during its long runtime- a few are whiffs, but the ones that connect do so convincingly. In true Blade Runner fashion, the exact elements that hit or miss are likely to be wildly different between viewers. Although it flies close to absurdity at time, the cast and story manages to steer things solidly back to interesting. And I’ll gladly take interesting from a popcorn movie in 2017.